nail polish | I’ve been switching back and forth between essie resort fling and zoya daul. the former I’ve already raved about, but once again, it’s a cheery melon, aka spring in a bottle, which is the closest to spring I’ve come to around these parts. the latter is a lovely purple with gold holographic shimmer. I’m usually a dark tips kind of girl, but even the grey-loving girl that I am is sick of all.this.grey. drugstore bits | man, is it just me or is the drugstore killing it with great stuff lately? I’ve been having a little rimmel moment. their scandaleyes eyeliner is already a staple in my makeup bag, and I’m going to add the show off lip lacquers and the scandaleyes shadow paints to the love pile. for the lip lacquer, I have the shades stellar, a gorgeous, warm pink and big bang, a bold, classic red. the color payoff is incredible, but I’m even more impressed with the staying power. once on and dried, nothing moves. perfect for us who can’t be bothered to check up on a bold lip in the mirror every 5 minutes. as for the eyeshadow paint, I have it in rich russet, a lovely bronze. I love that it comes in tube form. I just slap some on my lid, blend with my fingers, and let it set. one shadow eye, done and done. these are available online at asos but are quite expensive. I picked up my tube in a walgreens for ~$5, so you might want to hold off until it pops up at your local drugstore. and lastly, I picked up the vaseline lip therapy in rosy lips. it was a little bit of an impulse purchase because it just looked so cute in the mini tub, but it’s been fantastic for my dry lips. it’s moisturizing, not sticky, and leaves the slightest flush of pink on my lips. rms beauty | rms is a brand I’ve quickly fallen in love with. aside from being organic and all natural, I love the packaging and the way the products make my skin look. the raw coconut cream is a fantastic moisturizer. it doesn’t feel too oily on my skin, it’s incredibly lightweight, and it’s lightly scented, with just enough for you to smell a little bit like you’re in the tropics (never a bad thing) but not so much that you smell like a coconut grove. it’s a multi-tasker for me – sometimes it’s a moisturizer, sometimes it’s a makeup remover, sometimes it’s an all-over cleanser. the second product is the living luminizer. it’s the most flattering highlighter I’ve ever tried. it looks like you have nothing on and yet makes you glow in the most natural way. it layers beautifully with blush and is easy to blend. 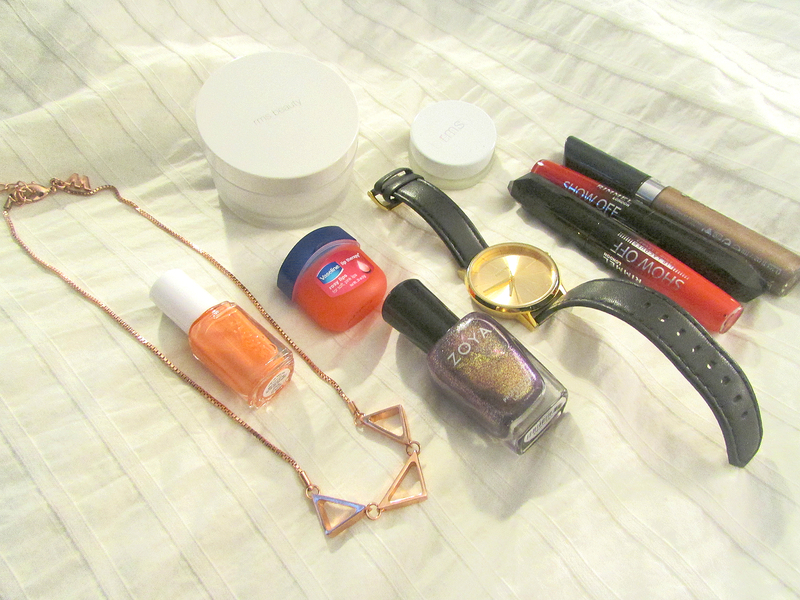 jewelry | the non-beauty favorites. both were Christmas presents, both have seen almost daily use. the nixon kensington watch hasn’t left my wrist this whole month, save for when I shower or wash dishes. it’s perfect for everyday wear but can be easily dressed up for a night out. I like the clean face, and the gold and black combo is simple but striking. the whistles triangle necklace has seen lots of use, too. it’s the perfect necklace for when you want a little more interest than a simple chain but don’t want to go all out with a “statement” necklace. I think I love both of these pieces because they’re so easy. the things that become my favorites are the ones I don’t have to think about – they just fit me to a t and fit my life and style seamlessly. playing favorites is an end of the month feature highlighting my favorite items in the past month. sometimes it’s ok to play favorites.